I am writing to inform you that our office has received your request to address the Durham City Council about water fluoridation at its Thursday, July 25th Work Session. This topic will be discussed at a future Work Session when the Public Health Director will be presenting recommendations to the Mayor and City Council. The future meeting date has not been identified but our office will contact you as soon as we become aware of it. Please be advised that this matter will not be included on the City Council’s July 25th Work Session agenda. Feel free to contact the City Manager’s Office if you have additional questions. 1) What is the format of this to be announced work session? Is it simply a reading of the recommendation already issued or will the ethics & science also be discussed among the council? 2) Will the citizenry be invited to participate in the discussion IE speak, ask questions, interact with those making the recommendations? If so, what format is the City intending to permit? What ensued was a series of phone conversations with one Karmisha Wallace, an assistant to the Agenda Coordinator Terry Kapers, who together ostensibly “manage the agenda” for the city council work sessions. I called in to get as much clarity about what was truly meant by this odd e-mail and why exactly the city would not allow the properly registered citizens to speak on public water fluoridation July 25th. DURHAM, N.C. – After nearly ten months of study, the Durham County Board of Health voted unanimously Thursday evening to accept the recommendation of a water fluoridation ad hoc committee, chaired by Dr. F. Vincent Allison, to continue the fluoridation of Durham’s drinking water supply at current levels. This recommendation is deemed effective for prevention of tooth decay and for promotion of good oral health by the United States Department of Health and Human Services (US-DHHS) Centers for Disease Control and Prevention (CDC). 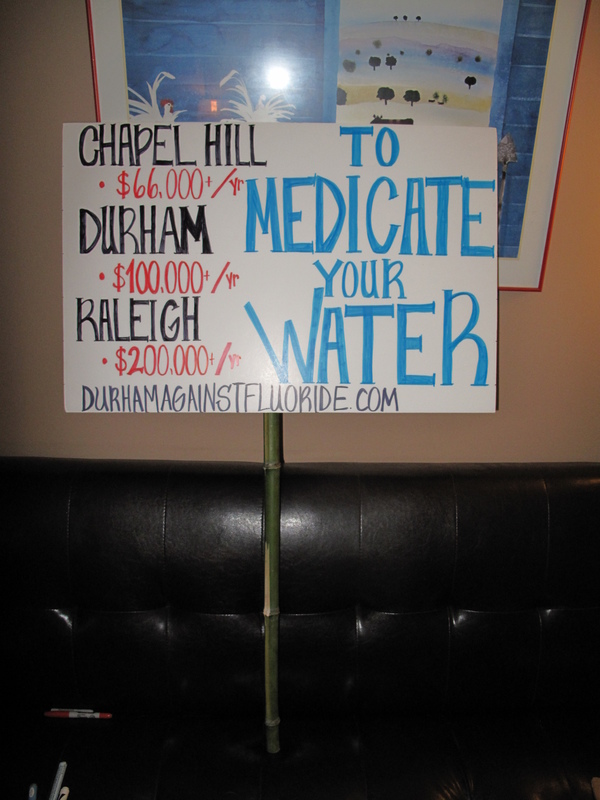 The issue originally came before the Board of Health in August 2012; after Durham City Council asked the board to investigate its merits, in order to address complaints made by a citizen of Durham that fluoride is harmful to our health and therefore fluoridation of drinking water should be discontinued. Why it has taken more than a month for Gayle Harris and her public health fiefdom to e-mail this link to the city council members is a rhetorical question who’s answer should be obvious to anyone who is not cripplingly naive. It is ludicrous to suggest that the City Council is not aware of this subject or the details of the recommendation made by their own ad-hoc committee since I am not even an employee of the government & I was aware of it a full month before I was informed by the bluffing city manager’s office that the City Council has not yet been told. I do not plan to wait for the public health director to formally present this recommendation to the mayor and city council, as these recommendations have already been publicly distributed and published on the county website. If water fluoridation is not an agenda item tomorrow, that is ok, I would still like to speak at the council tomorrow. Can you confirm that I will be acknowledged and allowed my time at the podium? Tomorrow’s City Council Work Session agenda has been established and water fluoridation is not included. It is up to the Mayor to permit individuals to speak at Council meetings, so I’m unable to confirm speakers. I understand you spoke with Karmisha Wallace yesterday and I should let you know that Mrs. Wallace and I both work in the City Manager’s Office and on managing the City Council meeting agendas. Undeterred & banking on the off-chance that the City Council would actually demonstrate some quantity of integrity, I appeared and prepared to speak exposing in 3 minutes or less why the public hearing which Durham worked so hard to produce was a total fraud & red herring. After sitting silently for more than 1 hour, I realized that not me or any one else who signed up to appear would be called. I subsequently left, resolving to expose this would-be King Bill Bell as soon as possible. Incidentally, the recommendation I intended to appeal was made based on the hearing which Public Health Director Gayle Harris had me removed from, thanks to the efforts of a Durham Sherrif’s deputy, for exposing the fact that Durham medicates our water supply with a corrosive industrial byproduct called Hydrofluorosilicic Acid – a powerful neurotoxin & carcinogen. Like all of the government’s recent pathetic & despicable behaviors we have exposed, the idea of King of Durham William Bell having the power to permit or not permit, as he sees fit, the citizens of Durham from petitioning their government is a peak example how debased & corrupt our society has become. To suggest that Mr. Bell has the god-like power to stifle the truth & our voice on a whim, for the sake of delaying the inevitable dirty truth about water fluoridation ever coming out, is a funny suggestion that I will soon destroy with gusto. For starters, I will be appearing tomorrow at the Moral Monday protests to expose fluoride & will be handing out literature. I will be carrying this – so look out for me! !